Dogs: Bullets and Carnage Wallpaper: so happy I could [kill]. 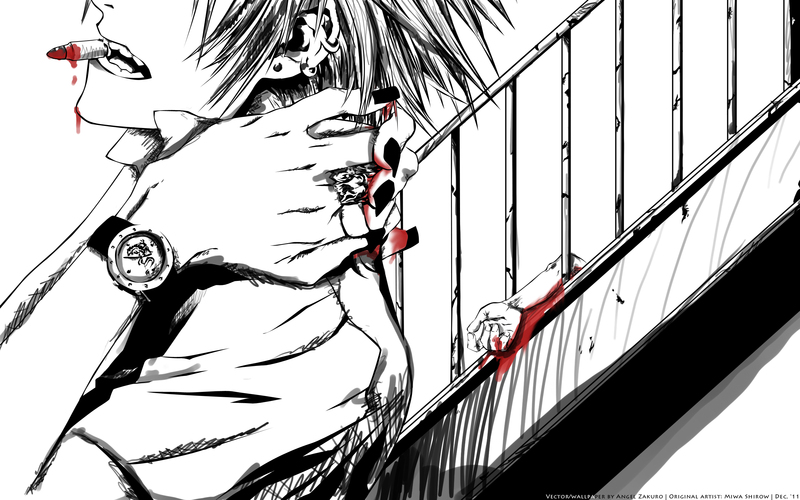 Minitokyo »	Dogs: Bullets and Carnage Wallpapers » Dogs: Bullets and Carnage Wallpaper: so happy I could [kill]. Wow. I haven't made a wallpaper in forever! Well. I just haven't felt like it. I've been enjoying making e-cards on theOtaku much more...and any walls I've made have been "lazy walls" that couldn't be submitted here. XD But this one is special since it's a Secret Santa gift for a member on theO (Felcie). Yes, I'm her Secret Santa, and she loves DOGS...so I made a wall for her of Haine. This wallpaper is...pretty violent for a Christmas present, but oh well. XD From what I hear (haven't seen it), DOGS is pretty violent lol. The rest I did with my tablet. I wanted to give it this rough, sketchy feel...I haven't done a wall like this before (I don't think lol), but really this is like how my natural drawing style is...how I draw with pencil is incredibly sketchy. >>' And I thought it worked well here. It was going to just be b/w, but then I decided to add the blood. :3 And that is how the idea came to have him kill a guy, and have the bloody bullet he took from the dead body in his mouth (lolwhat?). XD Yup yup. I know my shading isn't top-notch, but again, I went with my natural style, and I think it looks cool, whether it's accurate or not! Enjoy. : ) And happy holidays lol. Great work. The monotone with the splashes of red works well for such a wall! I actually think this scrawly, markers-and-pen style here makes it look self-made and kind of authentic. :3 I like the composition and the little morbid aspects with the broken arm and the hidden expressions. Gives it sort of secretive feel. Like everyone else said, I love the chaos and messy look of this one, your style looks great on monochrome stuff <3 For some reason I can't stop staring at his watch, the detail looks great *_* Only complaint is about the blood on his hands, it kind of looks too much like watercolor/markers compared to the rougher parts of the wall (like the hair). Oh, forgot to mention I love Badou's arm dangling from the staircase XD It adds that extra touch of macabre.